Signal processing is now a multidisciplinary topic, and one that has applications in many fields including, but not limited to, science, engineering, medicine, finance and the behavioural sciences. Modern software libraries that include dedicated languages and packages designed to simplify the development and application of signal processing techniques are now readily available; however this ease of application means that an understanding of the various techniques is imperative. It is critical that the student or practitioner is able to choose an appropriate processing technique, be aware of potential errors involved and understand how to control them. Discover Signal Processing exploits the rationale of “learning by doing”; actually attempting and performing a task is the most effective way to remember and understand. It presents the reader with a diverse range of exercises; some intended to recall or practice simple concepts, others more complex & aimed at developing a real understanding of the issues involved. These are accompanied by step-by-step explanations of the tools and techniques required. Provides systematic, organized and accessible instruction in a complex and mathematical subject. Uses MATLAB as a platform, utilizing its extensive GUI capabilities enabling exercises to be performed using graphical elements only. 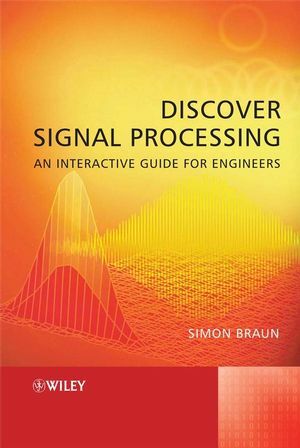 Discover Signal Processing provides an excellent & accessible guide to signal processing for mechanical, aeronautical, civil and electronic engineers in their senior/ graduate year. It will also be of interest to those attending CPD courses as well as to practicing engineers. Simon Braun is Professor at the Israel Institute of Technology, and has been active in the area of signal processing for four decades. He is the Editor in Chief of the Journal “ Mechanical Systems and Signal Processing” (Elsevier), the “ Encyclopedia of Vibrations (Academic Press) and author of “Mechanical Signature Analysis” (Academic Press). He has authored more than 60 papers in peer - reviewed journals and presented his work at conferences. He has conducted worldwide workshops (Europe, US, Australia, China), attended by Academics and Engineers and during sabbaticals, applied his expertise to industrial problems at GE and Ford Motor Co.
6 Time Domain Averaging (TDA). 11 Identifi cation – Transfer Functions. 13 Diagnostic Applications for Rotating Machines. 1.3 Why the Frequency Domain? 3.4 The Discrete Fourier Transform (DFT). 3.5 The DFT and the Fast Fourier Transform (FFT). 4.3 A Specifi c Case of a Continuous Linear Systems – Accelerometers. Appendix 4.A The Lightly Damped SDOF System. 5.2 Analog and Digital Filters. 5.3 Filter Classifi cation and Specifications. 5.6 The Importance of Linear Phase Filters. 6 Time Domain Averaging (Synchronous Averaging). 6.2 Rejection of Nonsynchronous Components. 6.3 TDA with Decaying Memory Process. 7.2 Representation of Signals in the Frequency Domain. 7.3 Errors and their Control. 7.4 Spectral Analysis: Practical Considerations. 8.2 The Hilbert Transform (HT). 8.4 Narrow Band (NB) Signals and their Envelope. 9.3 The Short Time Fourier Transform (STFT) and the Spectrogram. 10.1 Data Acquisition and Signal Processing Systems. 10.3 Quantization in Time: The Sampling Theorem. 11.2 Frequency Domain Identifi cation: The Noiseless Case. 11.3 Identifi cation with Noise Corrupted Signals. 11.4 Error Mechanisms and their Control in the Identifi cation Process. 11.5 Estimation Errors for the Coherence Function. Appendix 12.A The Correlation Matrix. 13 Machinery Diagnostics: Bearings and Gears. 13.1 Diagnostics and Rotating Machinery. 13.4 Modeling of Roller Bearing Vibration Signals. 13.5 Bearing Vibrations: Structural Effects and Envelopes. 13.6 Modeling of Gear Vibration Signals. 14.1 System with Pure Delays.